50-60 minutes by car (even longer in rush hour). However, it can be scary to start biking in a large city. As an urban biker, coming from Rochester, NY to Boston, I was a little nervous to get out on the busier streets. But I figured out a route to the closest bike path, and the rest is history. A safe urban cyclist knows two things: you need to be hyper-aware of what is going on around you, and you need to be extremely visible and transparent in your actions. Everything I’m about to say falls in to these categories. But first, the basics. Assume every driver is a lost tourist who’s not paying attention (and may even be under the influence). Many Boston drivers are tourists, or students who are unfamiliar with the streets. As a Massachusetts native, it’s hard for me to admit this, but Boston streets are infuriating. Drivers are often angry and erratic. As a cyclist, I spend a lot of time trying to anticipate where things might be confusing for drivers. If they’re confused, they’re less likely to be looking for you. Feel free to use double-wide sidewalks (safe for pedestrians and cyclists), wait for walk signs, and otherwise bike cautiously through confusing intersections. If you’re unsure, walk your bike. Tourist 1: Oh no! We were supposed to turn there, quick! As a biker, you need to be alert. 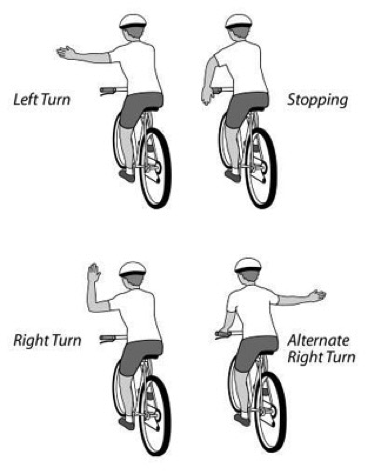 Hand signals: Learn them, know them, love them, use them. Wear lights at night, especially a front light. If a car takes a corner too tightly, your flashing light could save your life. Let your cell phone call go to voicemail. Let your texts go unanswered. Listen to the sounds of the road – take the headphones off! Good: Lights on your bike. Better: Lights and bright colored clothing. Best: Lit up like a Christmas tree (or Menorah on the eighth night) and dressed in obnoxiously neon yellow clothing. Closed-toed shoes. Know your rights: You can take up a full lane. You have the same rules as cars and trucks, except that you’re allowed on bike paths and not allowed on limited access highways. 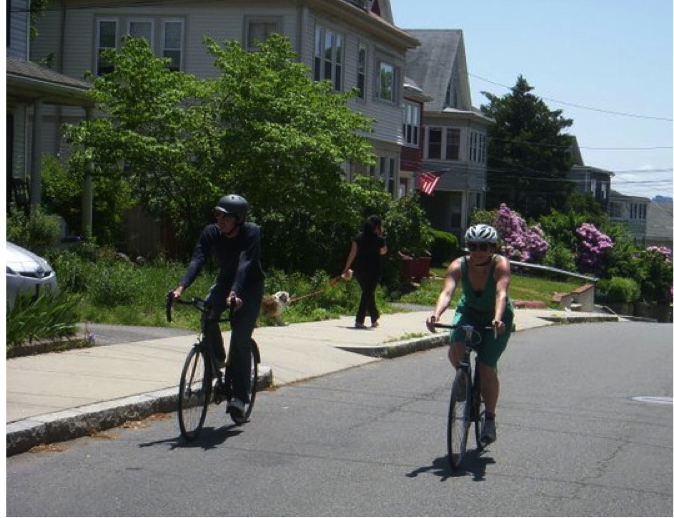 To understand and advocate for biker’s rights, you can join the Boston Cyclists Union. Know your limits: If I were to bet on a fight between a righteous cyclist and a truck, I’ll put my money on the truck. You’re smaller, and very few city drivers actually know a cyclist’s rights; it’s worth watching out. Don’t be a jerk: Stop at red lights. I know you get impatient, but stop first. If the coast is clear, then maybe you can go (but I officially didn’t tell you that). You can’t just blindly cross an intersection because you want to. Wait for your right of way, or until it is safe. If you’re really in a hurry, bike faster on the straightaways. Be vocal: Especially when you’re passing people. A clear “on your left,” can keep biker-pedestrian relations good and strong. A cable lock is a bike-thief’s best friend. Get yourself a U-lock before your first ride. Start small—figure out a route that feels doable to a place that you go often. If you’re in Somerville, find your way to the Minuteman trail. Your radius will expand as you learn the streets, gain confidence, and get invited to events that are just out of your current stomping grounds. You don’t need a new bike to get around Boston. I rode to New Hampshire on a cheap fixed-gear bicycle. Use what you’ve got. That said, keep your bike well maintained. Lube your chain, get tune-ups, pump your tires. Try bringing your local bike shop cookies, and keep frequenting the same shop place. If you treat your bike mechanic like part of your community, you might be able to get a faster tune-up. Avoid Huntington Ave and South Huntington Ave like the plague. This is where bikers get seriously hurt, and there have been enough deaths at Huntington and Forsyth that it demonstrates a poorly planned intersection. If you do find yourself there, be careful! Be aware that people—women especially—have gotten knocked off their bikes and mugged on the South West Corridor (JP to Downtown bike path). Know that you’re not invincible on a bike. If people look like they’re intending to get in your way, yell for them to get out of your way and speed up. Do whatever you can to avoid the situation. And finally, if you’ve been drinking a lot, you will fall off your bike. Act accordingly. Have fun, and ride safely! Feel free to get in touch with me if you have any questions, or want to take a ride! Lauren Kaskey is a second year FPAN/MPH student who bikes from JP to campus on most days. When she’s not on her bike you can find her playing with wild yeast in the kitchen.